The Renaissance Hotel is conveniently located for your business trip and vacation just five minutes from the Ataturk International Airport and twenty minutes from the city center with amazing views of the Marmara Sea. 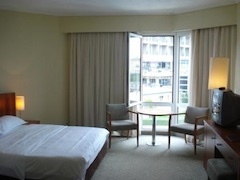 Guests are assured of a comfortable stay in 414 luxury accommodations. The hotel offers free airport and city center transfers. You can enjoy the selection of 6 luxury Restaurants and Bars for a relaxing and quality dining experience. At the Renaissance Polat Istanbul Hotel, friendly staff awaits your arrival and would be delighted to serve! 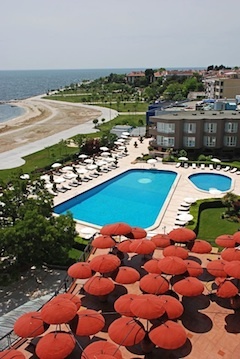 Cinar Hotel is located on the quiet shores of the Marmara Sea in Yesilkoy. Since its establishment in 1958, Cinar Hotel has been famous for its hospitality, warm atmosphere and consistent high quality of service. With its 357-bed capacity, 1 restaurant and 2 bars the hotel gives the opportunity to have the ambiance of being in a cozy resort in Yesilköy along the Marmara sea. 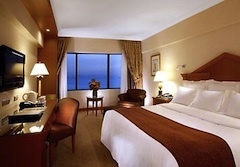 Note: Last day for hotel reservation is 03rd September 2010. 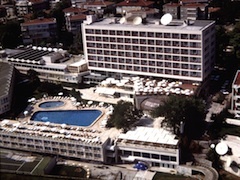 The above rates are quoted in EURO per room per night and include all taxes. Eating is a pleasure in La Delicatesse Restaurant either in a green garden facing the blue sea in the daylight or seeing the bright moon and the coast under the moon, but always facing the sea view in open air. There are various options to satisfy any taste on the menu prepared by the experienced Executive Chef of the restaurant, which serves international tastes. The selected flavors of the menu are accompanied by Turkish, Italian and French wines at La Delicatesse. The Restaurant serves lunch as of 12.00 and dinner as of 18.30 on seven days a week. Working Hours: 06:30 a.m – 10:30 a.m. 11:30 a.m. – 3 p.m. 4:00 p.m. – 00:30 a.m.
Great place to have a drink and taste delicious foods of American & Mexican cuisines while watching livesporting events on a wide-screen TVs. Enjoy its stunning view of the Marmara Sea;with flawless aperitifs,drinks from around the world,modern and classic cocktails and appetising 'Noblesse Bites'. Is a place with rustic atmosphere where you can find special delicacies of German cusine together with unequal coolness of beer.Always welcoming its guests with its unique country style,authentic decoration,elite menu and alternatives of beer. offer a la carte snacks including salads, sandwiches, ice cream and cocktails. 06:30 a.m. – 00:00 a.m.
09:00 a.m. – 00:00 a.m.
Overlooking the Marmara Sea,welcomes guests with delicious mouth watering mezzes,fresh and special fish selections,extensive wine and Raki menus reflecting the west coast culinary specilaties of Turkey. This informal restaurant presents breakfast, à la carte menus and international menus for lunch and dinner. Whatever your mood, the Mondial is versatile enough for dining in style or simply enjoying a light snack or tea, coffee and cake. Offers wide range of delicious chocolates,luscious tar and cakes,homemade cookies and pastries.Polat Patisserie is an excellente choice for an early-morning bites,an afternoon desert or light snacks for all day long. Offers a rich variety of food brought from the Kanton province,warm decoration,distinguished and delicious food. 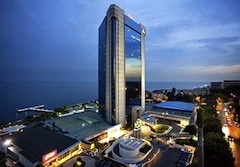 Hotel Shuttle Service (16 seats): for guests of Renaissance Polat Istanbul Hotel complimentary. No reservation will be accepted.